Raj Babbar admitted that the entry of Priyanka Gandhi Vadra into active politics, especially in Uttar Pradesh, had filled the party with hope. 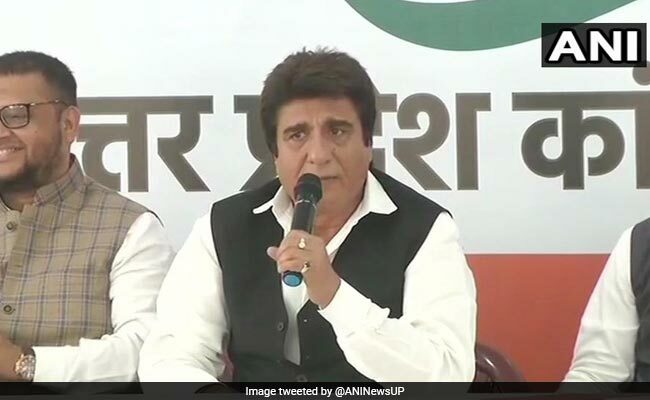 Raj Babbar said after several years, Congress workers across UP were actively working in the election. Uttar Pradesh Congress Committee President Raj Babbar said that his party was "clearly" on the path of resurgence. "The change is palpable on the ground and after a long time Congress workers are enthused," he told news agency IANS. "We are on the comeback path in Uttar Pradesh," he added. Mr Babbar, who is now campaigning in Fatehpur Sikri from where he is contesting, said, "For five years, people have seen how the Congress leadership was attacked by the BJP and people have also suffered the consequences of the Modi government's policies. This election is an election for change and the results will prove it." Mr Babbar said that after several years, Congress workers across Uttar Pradesh were actively working in the election. "The sense of despair among party workers is gone and they can see that the Congress is looking towards a new future." Mr Babbar admitted that the entry of Priyanka Gandhi Vadra into active politics, especially in Uttar Pradesh, had filled the party with hope. "We have a young leadership in Rahul Gandhi and Priyanka Gandhi. We also have the blessings and guidance of senior leaders including Sonia Gandhi and Manmohan Singh and this amalgam of experience and youth is very much evident in the Congress manifesto," he explained. Reacting to the joining of Shatrughan Sinha, Mr Babbar said, "We are happy at this development and many more leaders will be joining the party in the days to come - an indication that the Congress is back in reckoning." The Congress state president, however, refused to comment on the attack on the Congress by the Bahujan Samaj Party (BSP) and Samajwadi Party (SP) at the Deoband rally on Sunday. "In elections, everyone says what suits him or her. We are not going to waste time on such issues but will focus on the people. Our alliance is with the people and we will concentrate on strengthening that," he said. Asked about the allegation that the Congress in Uttar Pradesh was relying heavily on turncoats who had recently joined the party, Mr Babbar said, "In elections, every party looks for candidates who rate high on the winnability factor and the Congress is doing the same. If someone has joined the party and he or she deserves a ticket, we cannot deny the same because he is new to the party." In Fatehpur Sikri, Mr Babbar is pitted against his former acolyte Raj Kumar Chahar, who had been fielded by the BJP. The BSP has fielded Guddu Pandit, a proverbial party hopper who has travelled from BSP to SP to BJP and now back to BSP. Mr Babbar is banking mainly on the support of young voters and also the fact that he belongs to the neighboring Agra that is now a reserved seat.